By using the full power of the Very Large Telescope Interferometer an international team of astronomers has discovered exozodiacal light close to the habitable zones around nine nearby stars. This light is starlight reflected from dust created as the result of collisions between asteroids, and the evaporation of comets. The presence of such large amounts of dust in the inner regions around some stars may pose an obstacle to the direct imaging of Earth-like planets in the future. 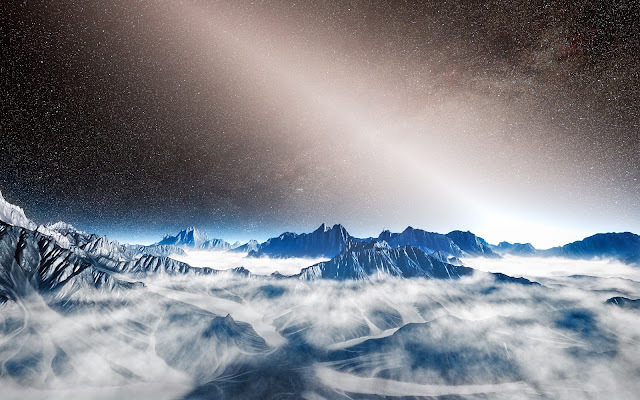 Using the Very Large Telescope Interferometer (VLTI) in near-infrared light, the team of astronomers observed 92 nearby stars to probe exozodiacal light from hot dust close to their habitable zones and combined the new data with earlier observations. Bright exozodiacal light, created by the glowing grains of hot exozodiacal dust, or the reflection of starlight off these grains, was observed around nine of the targeted stars. From dark clear sites on Earth, zodiacal light looks like a faint diffuse white glow seen in the night sky after the end of twilight, or before dawn. It is created by sunlight reflected off tiny particles and appears to extend up from the vicinity of the Sun. This reflected light is not just observed from Earth but can be observed from everywhere in the Solar System. The glow being observed in this new study is a much more extreme version of the same phenomenon. While this exozodiacal light — zodiacal light around other star systems — had been previously detected, this is the first large systematic study of this phenomenon around nearby stars. In contrast to earlier observations the team did not observe dust that will later form into planets, but dust created in collisions between small planets of a few kilometres in size — objects called planetesimals that are similar to the asteroids and comets of the Solar System. Dust of this kind is also the origin of the zodiacal light in the Solar System. Detecting faint dust close to the dazzling central star requires high resolution observations with high contrast. Interferometry — combining light collected at the exact same time at several different telescopes — performed in infrared light is, so far, the only technique that allows this kind of system to be discovered and studied. By using the power of the VLTI and pushing the instrument to its limits in terms of accuracy and efficiency, the team was able to reach a performance level about ten times better than other available instruments in the world. For each of the stars the team used the 1.8-metre Auxiliary Telescopes to feed light to the VLTI. Where strong exozodiacal light was present they were able to fully resolve the extended discs of dust, and separate their faint glow from the dominant light of the star. By analysing the properties of the stars surrounded by a disc of exozodiacal dust, the team found that most of the dust was detected around older stars. This result was very surprising and raises some questions for our understanding of planetary systems. Any known dust production caused by collisions of planetesimals should diminish over time, as the number of planetesimals is reduced as they are destroyed. The sample of observed objects also included 14 stars for which the detection of exoplanets has been reported. All of these planets are in the same region of the system as the dust in the systems showing exozodiacal light. The presence of exozodiacal light in systems with planets may create a problem for further astronomical studies of exoplanets. Exozodiacal dust emission, even at low levels, makes it significantly harder to detect Earth-like planets with direct imaging. The exozodiacal light detected in this survey is a factor of 1000 times brighter than the zodiacal light seen around the Sun. The number of stars containing zodiacal light at the level of the Solar System is most likely much higher than the numbers found in the survey. These observations are therefore only a first step towards more detailed studies of exozodiacal light.